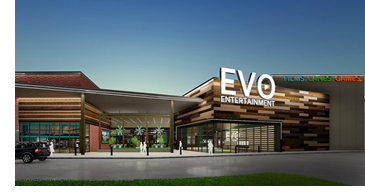 ​​​​ SCHERTZ – Wiederstein Ranch, a 95-acre mixed-use development, has named its first tenant to be EVO Entertainment. Construction has started on the 73,000-sf EVO Entertainment center located off I-35 along Wiederstein Rd​. It will include a ten-screen dine-in cinema, bowling lanes, arcade games, and a restaurant. The facility is set to open by February 2019.